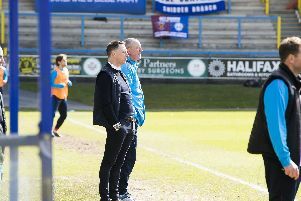 Neil Aspin is confident his new-look squad will be in place by the time FC Halifax Town return to pre-season training next weekend. Halifax have confirmed the signings of Dan Maguire, Elliott Whitehouse, Sam Walker and Josh Macdonald so far, but the Town boss says there are more new faces to come and expects to be working with a squad of 18 or 19 players. “The players we’ve announced so far are younger players with a point to prove,” he said. “But I’m well aware that we need some more experienced players as well. “Hopefully the next players we announce will be tried and tested players with a presence in the dressing room, which I feel is what we need. Aspin admitted he was disappointed to lose Marc Roberts and Lois Maynard after they joined Barnsley and Tranmere respectively, but he has called on the Town fans to put their faith in Town’s revamped side. “We needed to freshen things up,” said Aspin. “There are some players I would like to have kept, such as Marc Roberts and Lois Maynard. “But there is no way you can stop Marc going to Barnsley and with Lois, we’re not in the position to pay what Tranmere can offer. “But we needed to make changes and hopefully the supporters will get enthused by seeing some new faces. The Town chief also empathised with Matt Pearson’s decision to join League Two side Accrington Stanley. “Matty had a chance to go back to the Football League, but I spoke to him and said I would like to keep him,” Aspin said. “But he’d made his mind up that he wanted to go back into the league and it’s difficult to stand in someone’s way when they want full-time football. “The lure of full-time football will always be a problem when you’re a part-time club. But Aspin is remaining tight-lipped about who else has left the club. “I don’t want to minimise the chances of players getting fixed-up elsewhere by saying they’ve been released, which would weaken their bargaining position. Aspin was delighted to see former Town striker Jamie Vardy make his England debut in the recent friendly against the Republic of Ireland, which he said the forward had worked hard for. “It’s fantastic. It’s not going to happen very often that a player goes from non-league to playing for England,” he said. “Obviously we all hoped he’d do well and we thought he could play a lot higher, and it doesn’t get any higher than that. “It’s great for him and it’s also good for the club. “If we hadn’t taken him on then he might not have got the chance of achieve what he has. “It’s nice to think we’ve played a part in his success but a lot of it is down to Jamie’s work-rate, his ability and his application. The Town boss added that he believed Vardy could make it in the Premier League while he was at The Shay. “I got a few phone calls from clubs when he was playing for us asking about how good he was and I said to them that he could play at Championship level,” said Aspin. “A friend of mine at Sunderland, who were in the Premier League at the time, asked me about him and I said it was worth taking a chance on him.